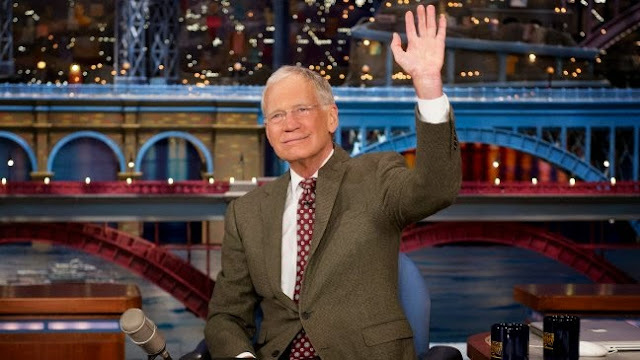 It's here, David Letterman's last opening monologue. The blurb on the video says that he "reveals a new Las Vegas act and gets send-offs from "The Simpsons" and "Wheel of Fortune" in his last Late Show monologue." The 68 year old host has been hosting the show for 33 years, and will be handing the reins to comedian Stephen Colbert. The last show featured no sit-down guest interviews, instead playing clips spanning his 33-year career, all the way back to his 1980s morning show on NBC. The top names turned up for one of Letterman's signature bits, the nightly Top 10 list, with the final one entitled 'Top 10 Things I've Always Wanted to Say to Dave', with Bill Murray, Jerry Seinfeld, Jim Carrey and Alec Baldwin taking part. David observed that he had done more than 6000 shows, then added that physicist Stephen Hawking had calculated "It works out to about eight minutes of laughter". See many of David's best clip in one post here.